Since I was undecided regarding what to blog about today, I checked my “drafts” folder and decided to tackle one of the 23 “posts-to-be” that had never seen the light of day. The oldest one is the list of Mama Kat prompts for the week of April 11, 2013. One of the prompts is “list 6 of your favorite quotes.” Seems like a timeless one to me, so here goes. 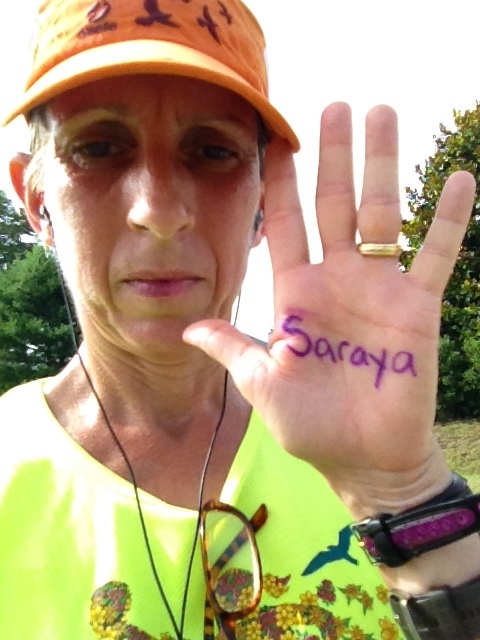 A day I ran for “Saraya,” one of the kidnapped Nigerian schoolgirls. So many inspiring quotes flow through my social media stream every day. Many of them give me a momentary spark of “yeah!” “so true!” “you only get one shot!” I have struggled, however, with the truth of those sentiments in the face of the reality of my obligations and choices I made decades ago which made it harder to truly “follow my bliss.” I guess the part of this that sticks the most is “say to yourself what you would be.” Without clarity about the eventual goal (what you would be), it’s possible you’ll waste a lot of time along the way expending your energies for things that don’t matter. Hmm…. the value of including this favorite quote was being honest with myself about the fact that I have not listed my goals for this year. Problem solved. 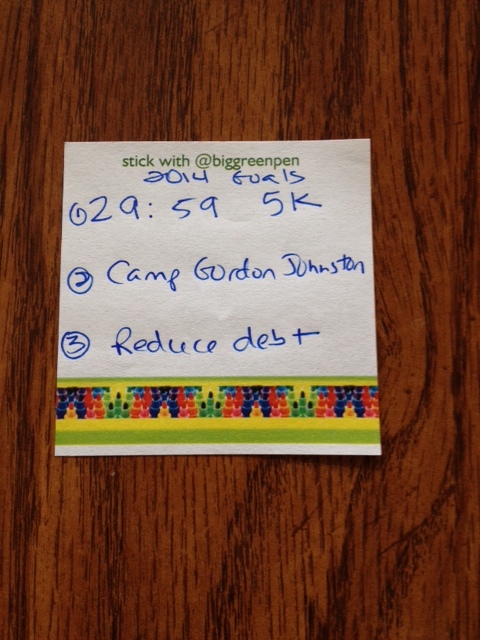 The “sub 30 5K” goal is a perennial. I am not giving up. I love this one, and it is in the same family of concepts (to me) as the Epictetus quote. This quote seemed relevant to my work as an administrator at a program subject to many different agency rule sets, some state, some federal. You may have a single-spaced 40-page technical guidance document holding you to what font size to use, what match rate to apply, what literacy level to write your materials to, but are you doing the task you set out to do? (which in our case was insuring uninsured children). It also applies in a more broad context to life; are we so busy ticking off mile markers that we don’t realize that the town we originally set out to visit is now deserted? A wise therapist gave me an assignment once to “check out whatever instantly appeals to you at the library and go away for a weekend and immerse yourself.” The only books I remember checking out were a childbirth book and a family relationships book. I wonder what I would check out on a similar assignment now, decades later. I know I love social media, and I know people I trust in the industry have advised me not to do it for a living. The appeal of social media (and the beauty of it) is the ability to write and communicate visually, along with “connecting the dots” of people who would not otherwise come into each others’ lives. This quote is from the movie Philadelphia. Besides the obvious truth of the quote (even though solutions often seem elusive), the movie holds special meaning for me. Wayne and I saw it shortly after his sister Ann died, and it seemed to tap into some deep emotional crevasse that had already been pried open. Ultimately, “every problem has a solution” ties into my #1 (“pronouns matter”). Some problems in our world seem to only have solutions riddle with imperfections that take those solutions out of contention. I think, however, we must not give up trying, for “our” girls, “their” girls …. for all girls. This entry was posted in Causes, Mama Kat Writers' Workshop, Running and tagged #bringbackourgirls, Alfred Korzybski, Brian Tracy, Central American Children, Cindy Levin, Epictetus, kidnapped Nigerian schoolgirls, Philadelphia, Quotes, Rumi by Paula Kiger. Bookmark the permalink. Great quotes! What a fun idea for a post. And the one about pronouns has definitely got me thinking. You’re absolutely right. Why do we feel differently about the two groups? Thanks for sharing. Thank you … I really appreciate you taking the time to comment! I like all of your quotes. Pronouns do matter! Thanks for these very inspiring quotes!